One of my favorite things about using Design Studio is that it gives me the ability to preview every image on a cartridge and try out design ideas before I purchase the cartridge. One of the new cartridges announced last week is called "Heritage" and as soon as I heard the name I thought it would be on my wish list. Once I updated my software and started looking through the images I was certain that I would want to add this cartridge to my library. 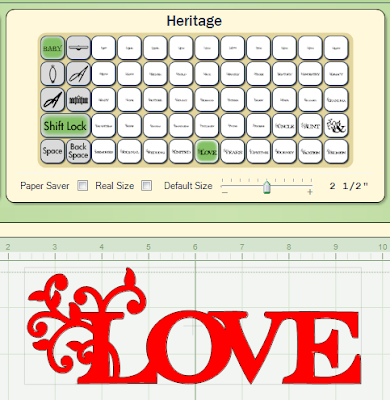 If you haven't updated your Design Studio to add the new cartridges, here is a LINK - you will need to log in to the Cricut.com site before you can download the font pack. Be sure to save the download to you desktop and then run the update - you should see the new cartridges the next time you open Design Studio. I do not have this cartridge yet and I am not sure how soon I will be able to get it but there is no reason not to start making files so I will be ready to do some cuts when I eventually have it in my possession. I will do a full review eventually, but today I am just sharing an idea that I had for a Valentine's Day card (I hope to have the cartridge before February!). 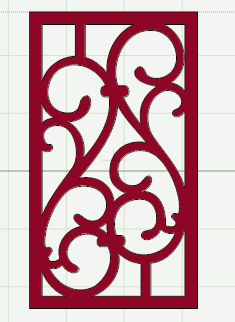 I saw this framed scroll design as I browsed through the contents of the cartridge. You know I have a weakness for swirls and flourishes - that is one of the reasons I use the Storybook cartridge so often. 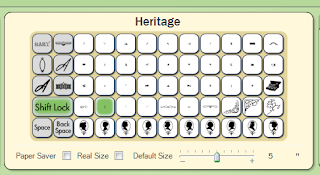 This keypad screen shot shows you where to find this image. Some of the keypads have teeny tiny icons. There is sometimes a way to fix this but I haven't tried it yet on this latest update. I'll let you know if it works and give you the directions once I have a chance to check it. I decided to rotate the image so that the "heart" shape that I could see would be more obvious. After I rotated the image 180 degrees (two clicks on the "Turn" button) I also resized the image to 5.5 x 4.25 inches - standard A2 card size - using the Shape Properties Box to enter the width and height. I decided to flip the image so the heart would "read" better from left to right. I grabbed a square from the George cartridge, adjusted it to 5.5 x 4.35 (a bit wider than the front to create a clean weld) and positioned it at 1.75 on the X axis and .3 on the Y axis. 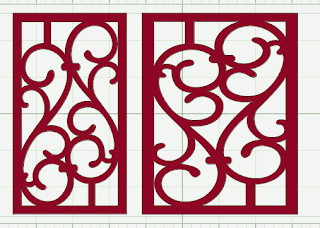 Then I checked weld for both of the images. (For color preview purposes I also have a page in the file with the weld box deselected and another page with a "filler" rectangle). The Heritage cartridge has all sorts of "old fashioned " images, as well as a font (a sort of wavery old style handwriting font) with a shadow option and some lovely frames and charms. There are also pre-welded words in a plain and a fancy style. The words are for all of the family members, relationships and occasions that would typically be included in a family history album. The images on the keypad are too small for you to see most of them in this screen shot. This set of words has a leafy swirl at the start of each word. 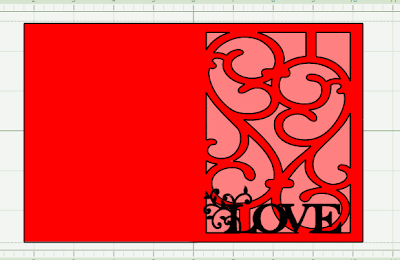 I decided to try the "fancy" version of the word "Love" on the card. 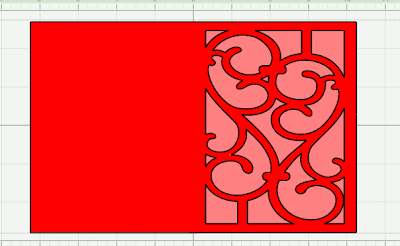 It may be too swirly - but I can keep "auditioning" cuts until I am satisfied with my design (another way that using Design Studio helps you save paper and time). So go ahead and start designing and choosing your favorites of the new cartridges - then when you are ready to purchase you will have a head start! 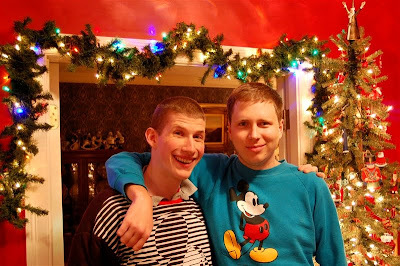 So now for the great news - both of our sons are home safe and sound! The extra days in San Francisco were put to good use by our older son and the plane trip today was uneventful (but the airport was crowded when we picked him up late in the evening). Here they are by the Santa tree in our front hall. The colorful lights in the garlands are a new addition this year - we decided to branch out from plain white twinkle lights by adding some new LEDs. We still need to add the ornaments to the garlands - a project for tomorrow. 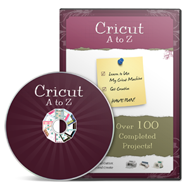 Finally - this is the last day to leave a comment for a chance to receive a copy of the Cricut A to Z instructional DVD. You need to go back to Sunday's post - here is a LINK - and leave a comment on that post to be included in the drawing. Thanks again to Megan of Above Rubies Studio for donating this DVD. I recently found your blog and discovered all the possibilities of Design Studio. Thanks to you a copy of DS is wrapped and waiting under my tree. Can't wait to start creating! Thank you Diane for showcasing a bit of this cartridge & the link! I went and downloaded the new font, and YES, I need this cartridge!!! I inherited all of my Mom's heritage photos of my family when she passed. I have scrapped a few copies, but really wanted something special for the photos from the late 1800s. This cart will be perfect!!!!! I am so glad your oldest arrived safely! Your boys are adorable, I know a silly way to describe grown men, but with families so far apart (which mine is as well), and you see them together, I don't know..it's just so touching! Happy Happy Christmas to Your family!!! Thanks again for all your hard work! Would love to win the DVD so I could use my Cricut for more than cutting out letters. Enjoyed the picture of your sons too. I get email updates to your blog! And you give me so much information and make me want to create! Can I borrow...maybe just your little finger? I just can't imagine or create anything near what you do. Thanks so much for letting me share in your knowledge!! Christmas, May your family be safe and may all your wishes come true!!! Truly you are an artist!